Package includes different colors headbands. length: 7.5 inch,width: 3inch. It can fit a newborn baby all the way to adults. 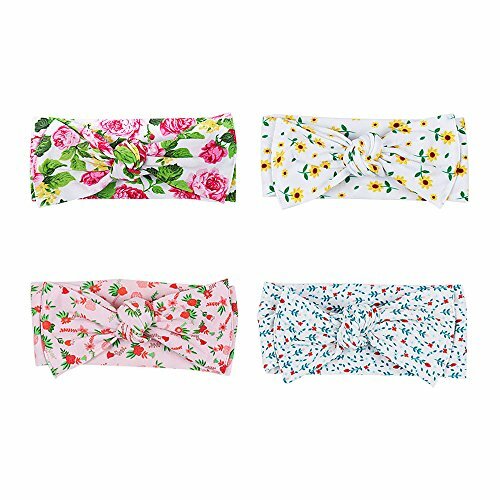 Headbands can be easily united for hand washing. Super soft and warm stretchy .Even the most sensitive heads, Babies don't even feel that the headband is there! Material:Stretch cotton, soft touch, can be easily united for hand washing. Package: Nylon Knotted headbands will come 4 colors in a zipper bag! Size: Headbands are about 7 inches with 80% stretch.So it can fit all adults. Perfect for any occasion: The patterns are bohemian style, whether it be at a photo shoot, playing in the park, or an important event. It is so easy to dress up or keep casual. Service: We really expect every Buyers 100% satisfied with our products, if not , Please do not rush to give feedback or reviews, contact us immediately so that we have an opportunity to solve this problem for you. Thank you! YOUR 100% SATISFACTION IS OUR TOP NOTCH! If you have any questions about this product by NCMAMA, contact us by completing and submitting the form below. If you are looking for a specif part number, please include it with your message.